These terms and conditions outline the rules and regulations for the use of Magic Room Brand's website. By accessing this website we assume you accept these terms and conditions in full. Do not continue to use Magic Room Brand's website if you do not accept all of the terms and conditions stated on this page. Summary: Magic Room Brand does not rent or sell your data and does not market on behalf of third-parties. We only use data you provide to make sure we can send you your gear, and that's it! - Account Registration. We will use your name, address, phone number, billing information, and email address to register your account for certain services we provide and to communicate important information to you. We may obtain additional personal information about you, such as address change information, from commercially available sources to keep our records current. - To Provide Our Services and Operate Our Business. We may use your information to operate our business, including providing the services you requested, provide you with support related to our services, and to help us protect our services, including to combat fraud and protect your information. - Customer Service and Technical Support. We may use your name, address, phone number, email address, how you interact with our services, and information about your computer configuration to resolve questions you may have about our services and to follow up with you about your experience. - Communicate with You. We may use your information to communicate with you about our services. - To Improve Services and Develop New Services. We will use your information to personalize or customize your experience and the service, develop new features or services, and to improve the overall quality of Magic Room Brand's services. - Feedback. We may use any information you volunteer in surveys you answer for us and combine them with answers from other customers in order to better understand our services and how we may improve them. Answering any survey is optional. - Redistribute content from Magic Room Brand (unless content is specifically made for redistribution). - Systemwide Accredited Businesses except soliciting non-profit organizations, charity shopping malls, and charity fundraising groups which may not hyperlink to our website. 2.) The organization types listed above may link to our home page, to publications or to other website information so long as the link: (a) is not in any way misleading; (b) does not falsely imply sponsorship, endorsement or approval of the linking party and its products or services; and (c) fits within the context of the linking party's site. We will approve link requests from these organizations if we determine that: (a) the link would not reflect unfavorably on us or our accredited businesses (for example, trade associations or other organizations representing inherently suspect types of business, such as work-at-home opportunities, shall not be allowed to link); (b)the organization does not have an unsatisfactory record with us; (c) the benefit to us from the visibility associated with the hyperlink outweighs the absence of Magic Room Brand; and (d) where the link is in the context of general resource information or is otherwise consistent with editorial content in a newsletter or similar product furthering the mission of the organization. If you are among the organizations listed in section 3.) above and are interested in linking to our website, you must notify us by sending an e-mail to whatsup@magicroombrand.com. Please include your name, your organization name, contact information (such as a phone number and/or e-mail address) as well as the URL of your site, a list of any URLs from which you intend to link to our website, and a list of the URL(s) on our site to which you would like to link. Allow 2-3 weeks for a response. - By use of any other description of our website or material being linked to that makes sense within the context and format of content on the linking party's site. No use of Magic Room Brand’s logo or other artwork will be allowed for linking absent a trademark license agreement. Adam Bertels of Adam Bertels Creative for the on-point design work seen in the “Here’s How It All Works” section. 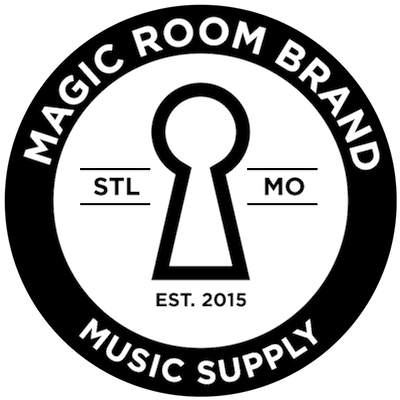 - Victor Pedraza for the ear icon in the “Why Magic Room Brand?” section. - Nathaniel Smith for the strong arm icon in the “Why Magic Room Brand?” section. - David for the earth/time icon in the “Why Magic Room Brand?” section. - Viktor Vorobyev for the heart icon in the “Why Magic Room Brand?” section. - Marvdrock for the guitar icon. - Parker Foote for the drumkit icon. - Louis Dawson for the drumstick icon. - Hum for the guitar pick icon. - Daniel Nochta for the parcel icon. - Stan Diers for the moped delivery icon.